It’s Friday – but instead of the Friday links I have the story of a giant post earthquake debris flow in the Wenchuan area for you. As I already announced in my last post about the field trip to the Wenchuan earthquake epicenter in frame of the International Symposium on Mega-Earthquake Induced Geo-disasters and Long Term Effects in Chengdu, China, I still wanted to blog about the Qipan gully debris flow that we also visited during the field trip. 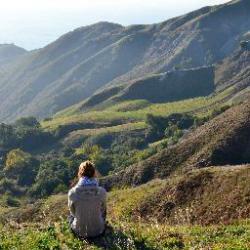 After giving you some background information I will take you on the hike with us. We will first see massive destruction in the residential area and then have a look at the debris flow deposits and some mitigation structures while climbing up the gully. Come on, let’s go! 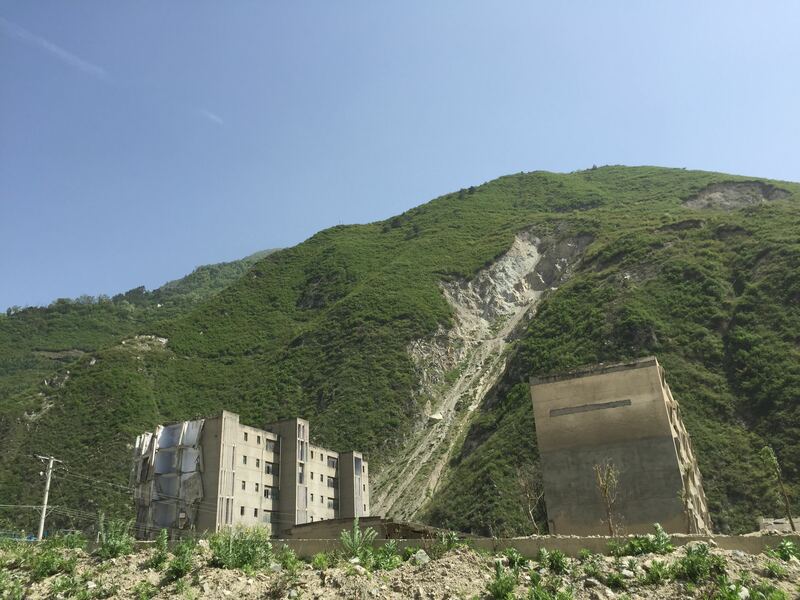 The paper “The landslide story” from Runqiu Huang and Xuanmei Fan provides a very nice, brief summary of the landslides and cascading effects induced by the 2008 Wenchuan earthquake, from where I took the following background information. The earthquake has triggered more than 60000 landslides within an area of 35000 km2, which caused approximately one third of the total number of fatalities. It was estimated that the frequency of landslides and secondary effects would remain above pre-quake level for at least one and a half decades. 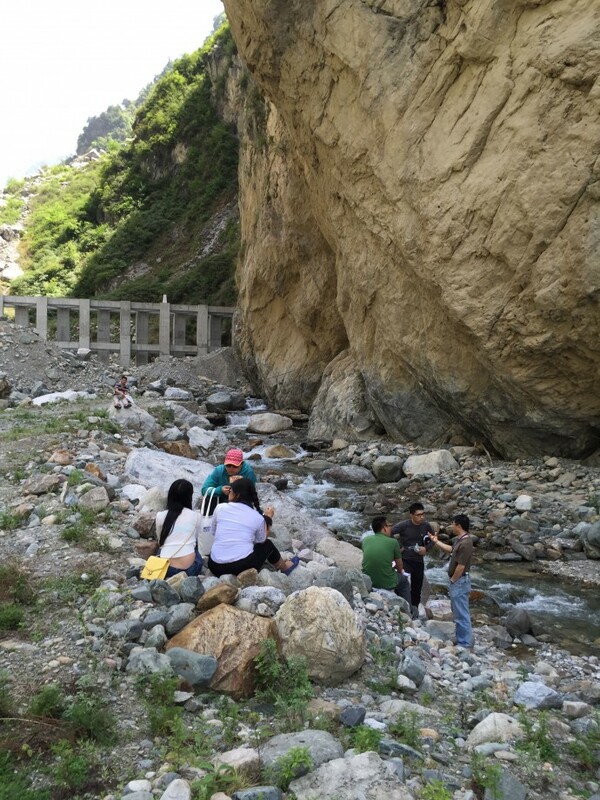 The rainfall threshold for the triggering of debris flows was significantly lowered while the number of debris flow occurrences more than tripled in the five years after the earthquake compared to the five years before the earthquake. Moreover it was found that the increase in sedimentation rates due to the landslides resulted in the elevation of riverbeds of up to 10 m, which is of course also causing problems. I wonder if this effect of riverbed elevation and abrupt increase in sedimentation rates is somehow considered by paleoseismologists. But now to our debris flow. 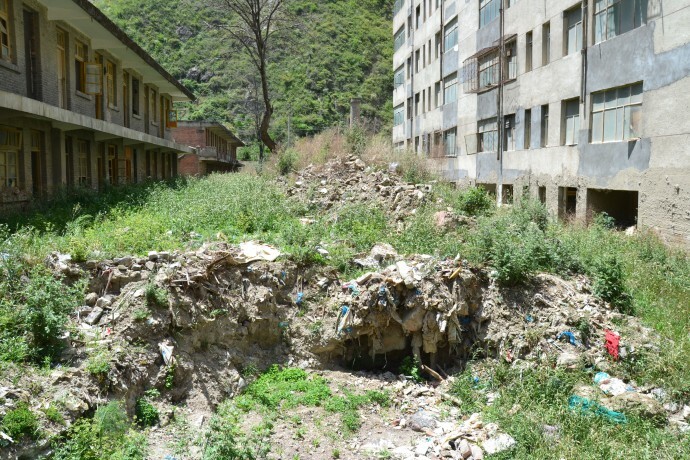 The Qipan gully debris flow occurred after a heavy rainstorm in July 11, 2013, at 3:30 in the night and left 15 people dead, destroyed more than 900 houses at the catchment outlet and dammed the main river. 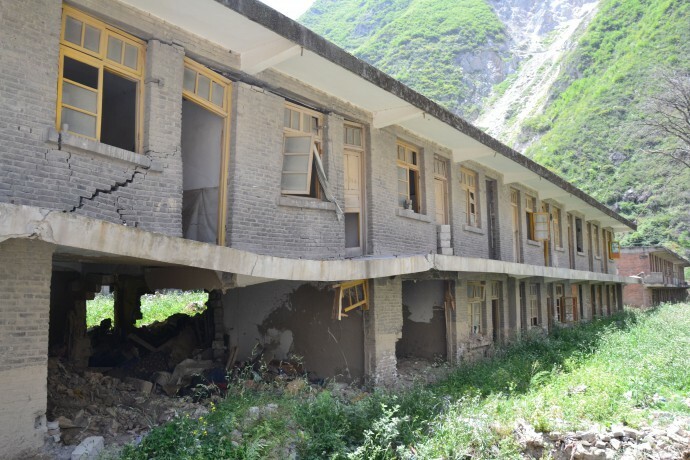 It is located some 5 km SW from the town of Wenchuan and roughly 40 km N of the main shock epicenter. The following information is from the paper of Zhu et al. (2015). Qipan gully has a length of around 15 km and a catchment area of approximately 54 km2. On the Google Earth image below you can see the lower 4 km of the gully. The topography in this area is relatively rough with steep slopes, as you will see below on the photos. 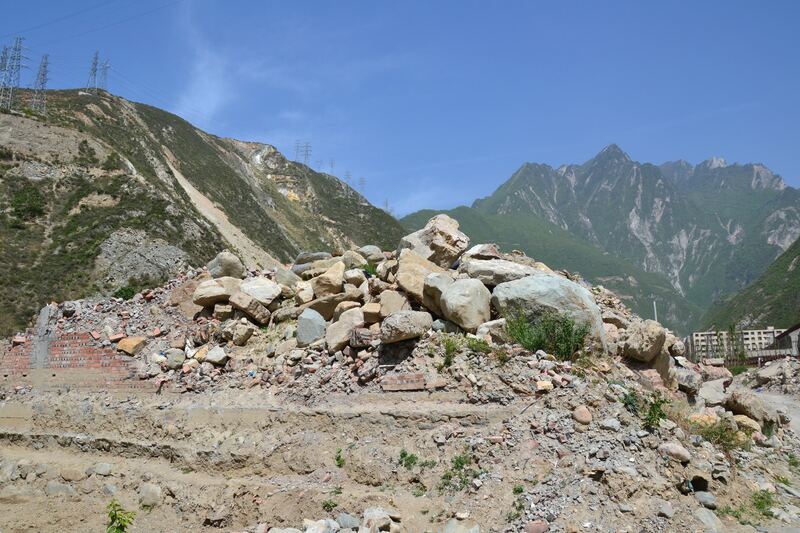 After the Wenchuan earthquake many landslides were found within the catchment. They were estimated to have provided a total debris volume of 22 Mio m3 and they produced at least three landslide dams in the upper catchment area that formed barrier lakes. Those lakes are suspected to have further amplified the debris flow, which was triggered by a rainfall event of relatively low intensity but with high accumulative rainfall amounts over three days. 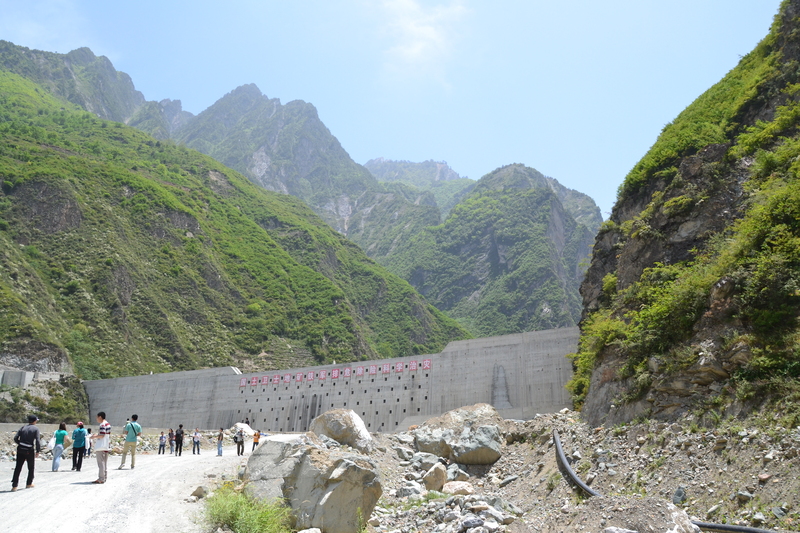 Thus, this devastating event was the result of a combination of several earthquake induced effects (landslides and landslide dams), but it occurred however five years after the earthquake and it was triggered by rainfall. So here is the problem: could such a cascading effect still be considered as an earthquake environmental effect (EEE)? I mean, if you found a paleo debris flow with a volume of 22 Mio m3 in the field, wouldn’t that stink like earthquake? Google Earth image of the lower 4 km of the Qipan debris flow as it is today, with mitigation structures. During our field trip we were hiking approximately 3.5 km upstream, basically on the debris flow. Especially down in the valley there were still many destroyed houses and in-situ debris flow deposits to be inspected. 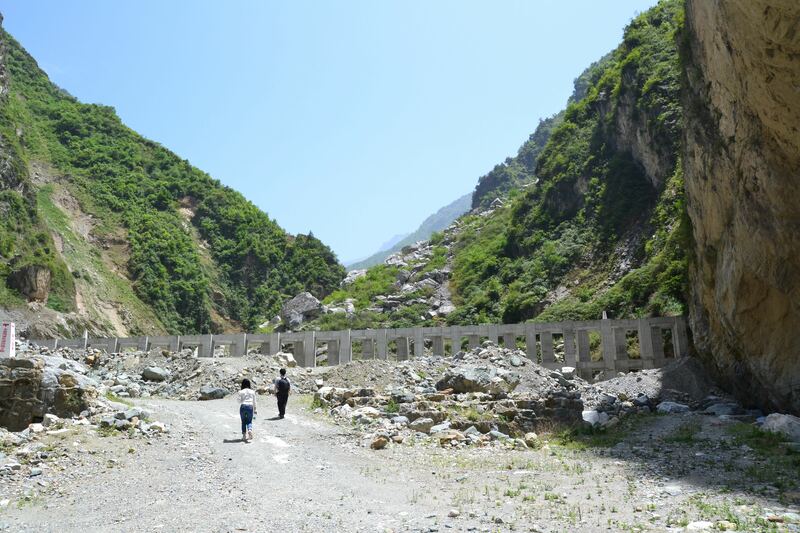 However, of course a lot was already cleaned up and moreover a massive debris flow mitigation structure was installed in the valley. 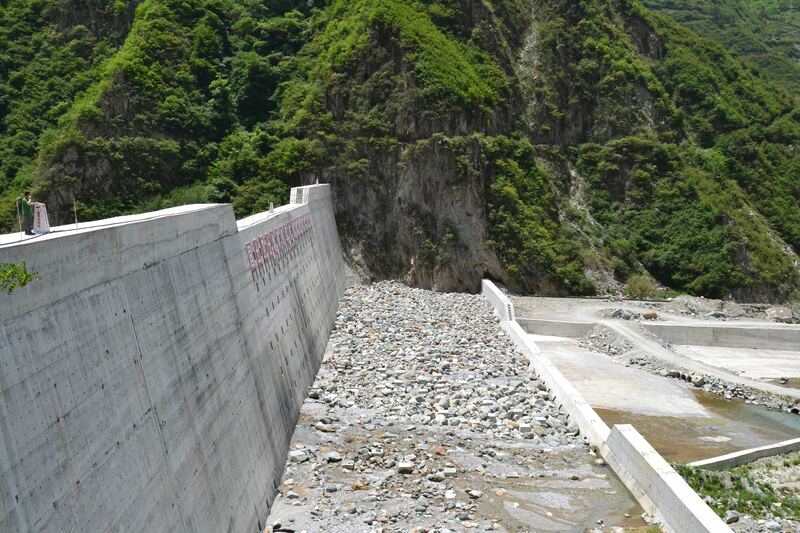 At approximately 3.5 km upstream a concrete retaining structure was installed to stop the large boulders and at 2.3 km a huge, massive retaining wall was build, which should stop the “smaller” rubble. The structures are indicated by the red circles in the Google Earth image above. A concrete channel downstream of the retaining wall is supposed to funnel what manages to pass the retaining structures. This looks all pretty impressive and especially the channel cutting through the middle of the residential area doesn’t really contribute to the beauty of the village, but I really hope that this will help to prevent future disasters. Plus it will help to maintain the resident’s awareness of the hazard. But enough theory, let’s climb that debris flow! 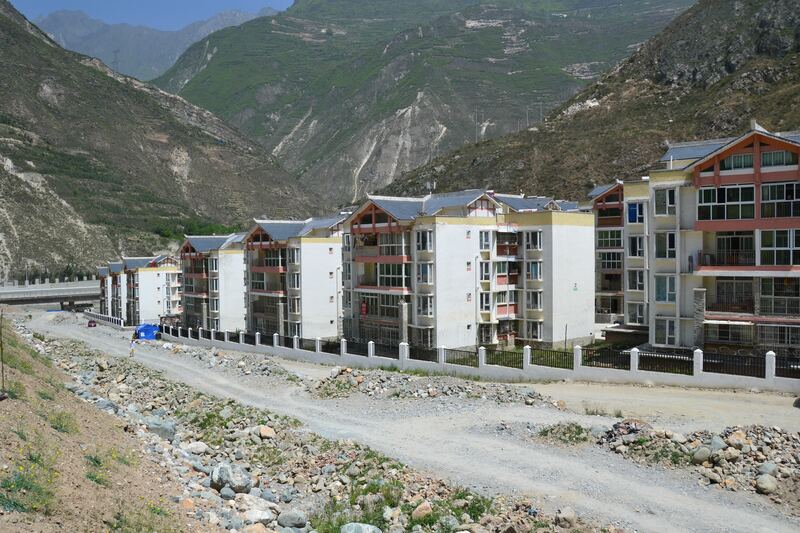 The following housing area at the bottom of the gully was newly constructed after the earthquake, just to be damaged again by the debris flow. 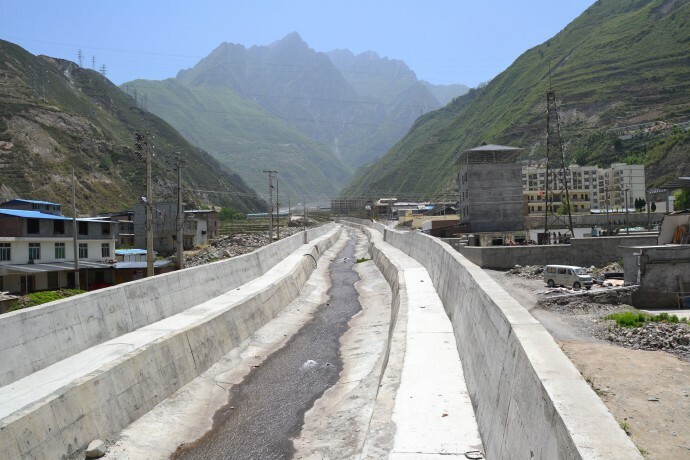 This is the newly constructed concrete channel that extends from the valley bottom about 2.3 km up to the first retaining wall. The channel is visible on the Google Earth image above. Here the debris flow tore half of the building away. And this site actually has more than one problem. You can see the following building on the above photo in front of the torn four story house. The debris flow crashed through the back facade of the ground floor and exited through the front, taking some supporting walls with it, which is why the floor sagged. Close-up of two story house, sagged floor, destroyed facade. In front of this house there is an in-situ deposit of the debris flow that took an uphill garbage dump with it through the above house. Maybe in the future these anthropogenic deposits will be found by archeoseismologists? On the right you can still see the mud on the wall, also from the debris flow. In-situ debris flow-garbage dump deposit. 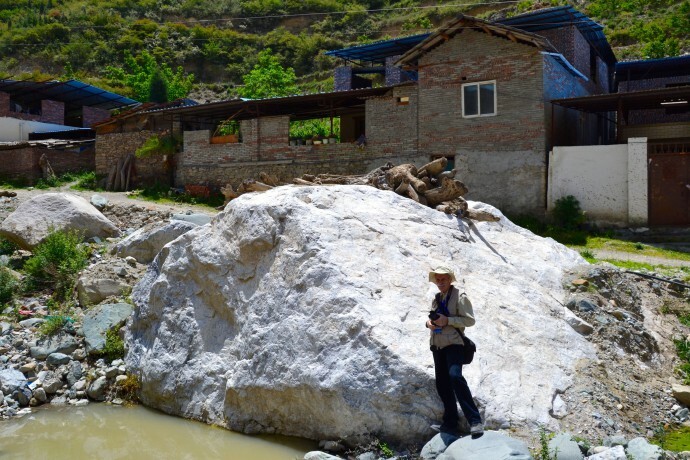 The debris flow also went through the ground floor of the following house several meters uphill. See the big holes and how remarkably the pillar on the left is bent. By the way, on this side of the gully there is now a driving training site for trucks… But the damage is definitely from the debris flow. Destroyed house with bent pillar. The following boulder with Alexander Strom as a beautiful scale is more than half buried now. It was transported here by the debris flow, as several other large boulders. The largest one, having a size of about 12 m x 5 m x 6 m and a mass of 1000 tons, was transported over a distance of 1000 m! Destroyed house with debris flow deposits. We arrived at the retaining wall. …and found the unmitigated debris flow deposits. See the badger and the cars as scales. The space behind the retaining wall would have to be cleared regularly for the wall to remain effective. Debris flow beyond the wall. 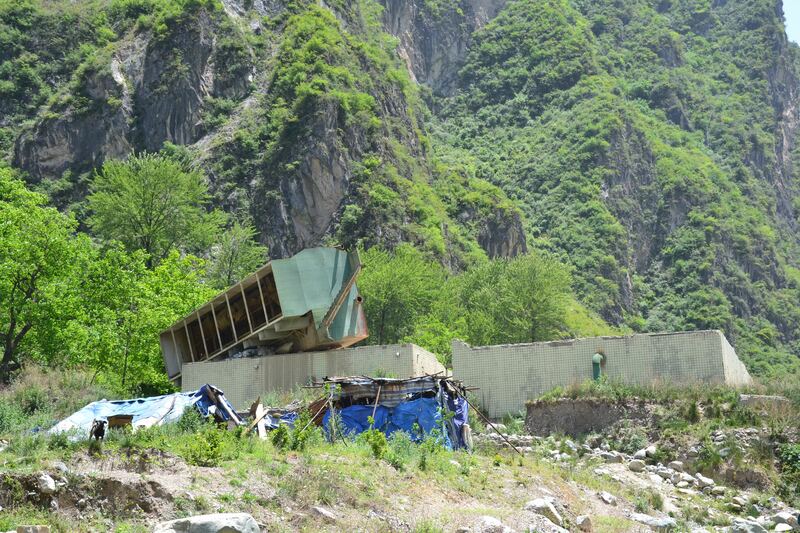 I assume that this container house (on the left of the above photo) was also transported here by the debris flow. 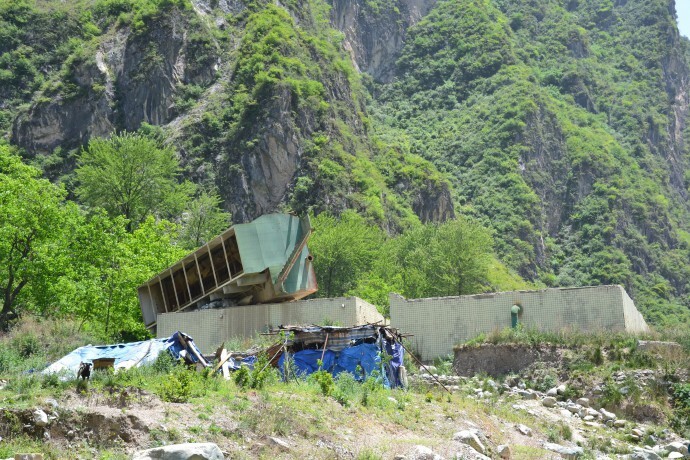 Container house, moved by debris flow? …and had lunch on the landslide. Above you can see some boulders coming from another landslide. After lunch we started our descent, discussing about the mitigation structure or being just amazed from the power of the debris flow. 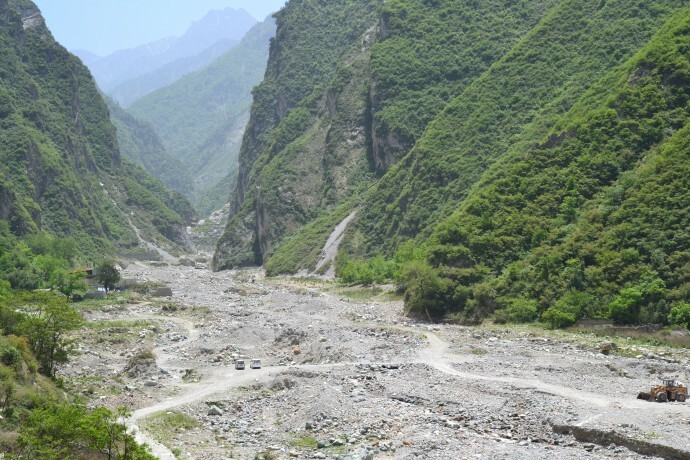 Many similar events occurred in the Wenchuan area in the years after the earthquake and I guess there is still some landslide debris remaining dormant in the valleys, waiting for rainfall. I am also curious if and how the debris flow potential in the Nepal earthquake area will change. We will probably already see during the coming monsoon season. Anyhow, that’s all from the Symposium on Mega Earthquake Induced Geo-disasters. I hope you enjoyed it. So long! Zhu, J., Tang, C., Chang, M., 2015. 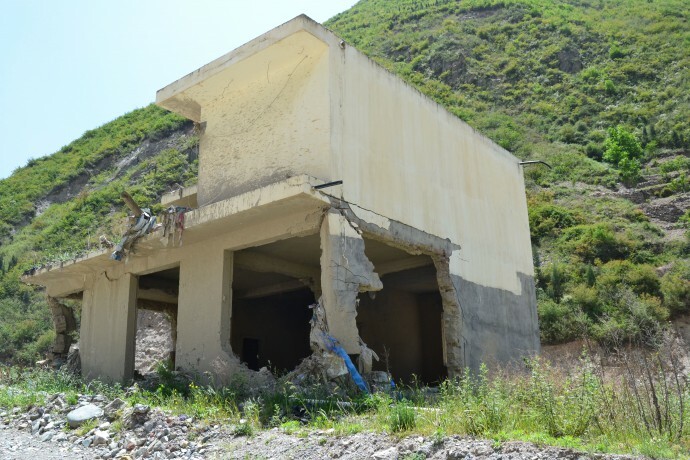 Field Ovservations of the Disastrous 11 July 2013 Debris Flow in Qipan Gully, Wenchuan Area, Southwestern China. Engineering Geology for Society and Territory Volume 2, 531-535.